My favorite type of resource changes every week. First it's styles, then it's actions, next comes brushes... it's a neverending cycle. With this bundle, you'll get all your favorites in one huge collection. This deal includes thousands of freshly crafted actions, brushes, textures, Smart Object templates, Photoshop and Illustrator styles, and much more from the most creative designers on the planet. Each type of resource is geared towards a specific niche of design or photography. The value included in this collection is out of this world. You're not just getting one type of resource, but EVERY type, allowing you to enhance your creative workflow, no matter what type of project you're working on. All of these files work in Photoshop CS3 and newer, with the exception of a small amount of Photoshop actions. Not only do you get a huge quantity and range of files, you also get the flexibility to use them in even more projects, including items for resale. That includes designs for mass production, print-on-demand services, or even digital templates you plan to resell in your online shop. Of course, there are a couple small restrictions. Other than that, go crazy! If you have any specific usage questions, feel free to contact us and ask away. Now recline your chair and get cozy, because the scrolling is about to get serious. The first question that came to mind when I saw the Beto Alanis shop was simply, "how?" I've made my fair share of Photoshop actions in my day, but his creations are breathtaking. This set includes over 200 Photoshop actions to create a plethora of different effects. You'll find anything from matte and color toning looks to highly specialized effects like light leaks, double exposures, and a lot more. You can tell that hours were spent perfecting each and every action in this set, and you get to reap the benefits. If you are a photographer, a designer who works with photos, or have ever heard the word "photograph", you owe it to yourself to try these actions on your images. Creativenauts is the perfect name for this design shop, because the level of creativity in their work is not of this world. One of their specialties is layer styles, and we're got the best of the best just for you. There are 20 Photoshop layer styles in this pack, each created to replicate popular movie titles of the past and present. Not only will you get the easy, one-click-use ASL style files, but you'll also get the Photoshop PSD files used to create all the preview images below. Creators Couture is well known for their superior style collections and resources for graphic designers, and we've got two of the sets that made them famous. InstaGlam is a unique creative system that allows you to take anything in Photoshop and instantly apply gold and glam styles. Not only that, you have millions of options, but it’s NOT overwhelming. You simply play the action and you can easily toggle between 162 base styles, move them around effortlessly for different effects, and re-color them with a single click. For those who simply prefer Photoshop layer styles, there are also 578 new "smart" styles, to apply the styles in both gold and color options, in both web and print resolutions. You can also paint directly in "gold + glam". Simply run the action or pre-apply a layer style to prepare your canvas, then pick one of the 150+ dynamic Photoshop brushes (or use one of your own favorites) and start drawing and creating. You get to see your effects instantly as you paint, and (so cool) change at any time between 162 base textures and change the color with a click... and all of this non-destructively! Creative Couture is another unique, creative system inspired by fashion and haute couture that allows you to take anything in Photoshop and instantly apply stunning styles in any color or rich gold. Not only that, you have millions of options, but it's NOT overwhelming. You simply play the action and you can easily toggle between 215+ base textures, move them around effortlessly for different effects and color them with a click to suit your design. You can also paint directly in these fantasy styles. You apply a layer style to prepare your canvas, then pick one of the 150+ dynamic Photoshop brushes (or use one of your own favorites) and start drawing and creating. You get to see your effects instantly as you paint, and (so cool) change at any time between 162 base textures and change the color with a click... and all of this non-destructively. Panoply: a complete and magnificent array. That's just what Design Panoply provides with their wide assortment of premium design resources. This set includes 59 Photoshop brushes created by dripping ink onto a variety of textured surfaces to help give your work a creative, handcrafted feel. Each brush is 2,500 pixels in their largest dimension so you can use them all in both print and web-sized projects. 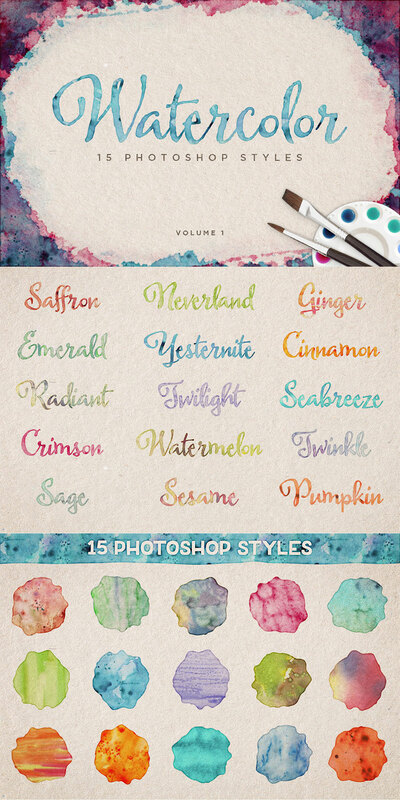 Each of the Photoshop styles in this wonderful pack were created by very talented and experienced painters to give you the most authentic, realistic watercolor effects possible, perfect for text and shapes. Once the styles are installed, a single click will give you instant results that you'll want to use in all of your new projects. These JPG textures were professionally lit and photographed for the absolute best quality possible. In the L'Artiste collection, you'll find canvas, art paper, card stock, and many other artistic surfaces ranging from subtle to moderate. The rust textures include a variety of grungy surfaces, perfect for that industrial look. Lastly, the 20 subtle, seamless textures are perfect for overlays or layer masks to add some depth to any type of project. Also included with are 3 free bonus logo Smart Object mockups. Just copy and paste in your own graphics and hit save for a realistic looking mockup. FilterGrade puts out what are arguably the best actions for photographers you can get. If you want to take your photos to the next level, these are the files you've been waiting for your whole life. This bundle is actually a bundle of 11 other bundles. After bundling it into this deal, you're getting 3x more bundling than ever before! When you want to give your photo a specific look, just open the appropriate set, try a few actions, and you'll have something unique and special to share with all of your followers. Gearwright knows how to make Photoshop Smart Object templates that you'll find yourself using time and time again. These files are no exception. These 7 sets give you classic looks like worn ink, chalk/charcoal, overprints, and more, all with a simple copy and paste. Just input your own text, shapes, or imagery and when you save the Smart Objects, all the effects are automatically applied. You'll also get some bonus items like handmade, rolled ink textures and more. If you like replicating old-style designs, these templates will be your go to items. Layerform crafts a lot of useful stuff, and I wish I could include it all in this bundle. The good news is that this deal features some of their best work, including brushes, Illustrator styles, and textures. These 6 sets of Photoshop brushes cover all your creative bases. You'll get watercolor blobs, vintage woodblock prints, fractured shatters, splatters, and more. Check out the previews below to see each set in use. Many designers make Photoshop styles. Fewer create Illustrator styles. An even smaller portion of those files are actually useful. This is the best set of vintage Illustrator styles I've ever seen. All you need to do is select your vector text or shapes in Illustrator and click a style. BAM! Instant vintage looks. You'll also get a bonus pack of 54 handsketched vector arrows. These high resolution JPG textures come in standard and inverted, neon versions that are perfect for backgrounds, overlays, and layer masks to give your work artistic effects in no time. Texture Club is one of the best shops I've found for textures geared towards more creative users. This deal includes 7 of their amazing texture packs, plus a set of sketchy letters, numbers, and symbols in vector format. You'll get brushed backgrounds, fine grit, grungy scratches, and a whole lot more. These files are perfect for use as overlays and layer masks, and can be layered together with different blend modes to create an unlimited number of different looks. There's no easier way to add some depth to your designs that with textures, and there's no better textures than these. Zeppelin Graphics puts out some of the most creative styles and effects in existence, and luckily for you, we've got them all in this deal. These files are much more than simple layer styles. Although you will get a collection of ASL Photoshop layer styles, you'll also get PSD Smart Object templates for each and every preview image you see below. Just type your text into the Smart Object layer and you'll have instant 3D effects. You also get all the backgrounds and scenes you see below, giving you a ton of flexibility. These files are just like the text effects above, but with a classic, vintage feel. Just apply the included Photoshop layer styles, or open and edit the PSD Smart Object templates to your heart's content. This single PSD Smart Object template brings you a 7 unique effects with 3 different backgrounds. Plus you can move and customize each and every layer to get 100% custom looks and just the perfect crop for your images. These 2,500 x 1,800 textures are subtle, yet insanely eye-catching at the same time. If you're looking to create a good looking background in a hurry, these textures will be your new favorite tool. These 10 Photoshop templates bring you even more retro goodness. Just double click and edit the text inside the Smart Objects, then you can customize backgrounds, colors, and more. Can you believe you scrolled that far, but you STILL wanted to see more? That just means that everything in this collection is something you can start using in your current work right now. Normally, all of these files would cost you over $938 sold separately. For a short time, you can grab everything for only $39. That's 96% off the regular price. After purchase, open the provided ZIP file for download links and instructions. Files are provided in a variety of file formats. See descriptions above for detailed information. Files can be used for both personal and commercial projects, plus projects created for resale.